Before the City Council’s first meeting in the newly renovated San Dimas Civic Center, the city had an open house and ribbon-cutting celebration Tuesday for the $12 million project. 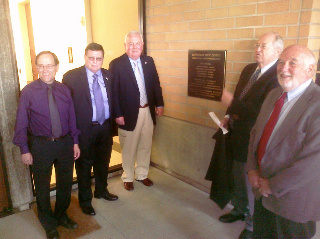 There was no actual ribbon, but Mayor Curt Morris and Mayor Pro Tem Jeff Templeman unveiled a dedication plaque near the building entrance. The open house featured public tours and commendations from various county and state politicians. The expansion and renovation took about a year to complete. The new Civic Center opened for business April 5. Absentee results have been posted in the city council and mayor elections, giving comfortable margins to Curt Morris, Emmett Badar, John Ebiner. Each have at least 65 percent out of just less than 1,000 ballots. Results will be updated on the city’s website. His website is sparse, featuring only a short statement and an e-mail address, but I imagine that will change. Incumbent Emmett Badar and challenger Chris S. Grant also have websites. In the mayoral election, it looks like Curt Morris’ website isn’t updated often, and I couldn’t find anything for challenger Sid Maksoudian. Sid ran for council two years ago and is well known for his criticism of the current regime, so I expect to have lots of information from him as election season gets into full swing.